Home»Patient Education»Dental X-Rays: Get the Real Picture! X-rays help pinpoint problems and avoid further complications. People are often concerned that they’re receiving too much radiation from X-rays, so it’s important to understand why the benefits of X-rays (taken at reasonable intervals) far outweigh the concerns! The purpose of X-rays is to pinpoint problems and avoid further complications. Without them, we couldn’t find decay under fillings or between teeth, we couldn’t find abscesses or tumors in gums and bone, and we couldn’t detect faulty development of adult or wisdom teeth. We also wouldn’t be able to see the formation of pockets around teeth or the loss of bone caused by gum disease. Furthermore, the risks are widely misunderstood, and dental X-rays in particular use less radiation than just about any other variety. During a checkup that includes either 4 bitewing or 1 panoramic X-ray, patients receive a dose of .005 or .01 millisieverts (mSv) respectively. That’s the equivalent of about 1 or 2 days of natural background radiation. Compare that with full-chest X-rays that result in 10 to 20 times as much exposure (0.1 mSv), or pelvic X-rays that require 60 to 120 times as much (0.6 mSv). 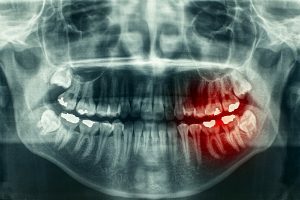 So why do dental X-rays use such little radiation? Since teeth are close to the surface of the skin and grouped in a relatively small area, dentists can achieve the same high-quality images with a narrower beam and much lower intensity. We’ve taken other steps to reduce the risks!